You are currently browsing the archives for the Giftware category. Imagine my delight when I open my favorite magazine, New York, and recognize a full page photo of a nail file from our very own homegrown company Diamancel. The Best Bet section suggests that you shouldn’t use a pumice stone on your feet as it collects bacteria. It quotes Dr. Krista Archer, a podiatric surgeon who likes Diamancel surgical grade steel foot files and so do I.
I’ve been singing their praises and using a Diamancel nail file for as long as I can remember. It works amazingly well and you never have to buy another one. The diamond is the hardest, most abrasive stone known to man. So Diamancel has created a unique line of genuine diamond files using this property. I stock up on them for gifts. Each flexible diamond nail file in the Diamancel family has been designed for specific nail types to beautifully shape and enhance both natural and sculptured nails. The Diamancel Diamond Hand and Foot Callus Files are ideal for removing and softening rough, dry skin. Discover Diamancel’s Sacha™ Diamond Nail File for pets. A great alternative, Sacha™ Diamond File replaces the often-unpleasant cutting process with an easy and effective filing method. No cutting required. Diamancel files provide effective fast, easy and effortless filing. They are durable and will outlast all your files, which make them a money saver. They are hygienic too as they can be soaked and disinfected in medical grade solution. These are effortless to use as you can use a light hand and the diamonds will do the work for you. All files have been salon tested for maximum performance. You can order your files now on their website or you can see them and feel them in person in the new showroom is now open every Monday 9-3. If you head there, you will also discover the Arbonne wellness health and nutrition botanical products for the whole family. While it’s icy and snowy out there, you can still accomplish alot from your keyboard. It’s even better when you can shop-at-home at a store right here in Montreal and keep the money in our own city. Goldtex now has an e-commerce site which is simple to use. You can get your kids all clothed for the Spring – while shopping from the comfort of your couch. They we will also match the price of any online retailer in Canada. This superb outlet is hidden amongst factories in LaSalle, but if you want to venture out there, it’s worth the trip to find it. Some of the clothing brands in sizes from newborn to 16 are: Nike, Absorba, NHL, Nasri, Rococo, Gusti, Perlimpinpin, Soul & Glory, and much more. If your kids have outgrown their school color code clothing – they sell it here: shirts, dress pants, unisex white polos, cargo and Bermuda shorts, cords, tunics, skirts, cardigans, blazers, knee highs and tights. If the kids are signed up for dance lessons, have a look at their dance wear, which includes ballet and tap and jazz shoes, all by Mondor, Danshuz & Motionwear. Formal parties coming up? The upper mezzanine has fancy party dresses, even for flower girls, suits, tuxedos, outfits for communion, confirmation and baptism. There’s Perlimpinpin, Cocalo and Jolly Jumper bedding and lots of bottles, hats and shoes at the front. For the babies, you can pick up hooded bath towels and sleepers. Baby accessories are by Safety First, Nuby, Graco, Avent, Dr. Brown and Medela and cribs and strollers by Graco, Baby Jogger, Quinny, Peg Perego & Lil’ Angels. 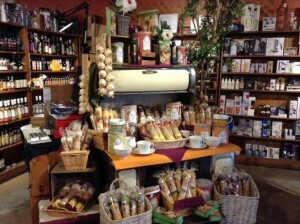 Posted in Beauty, Clothing, Family Business, Food, Giftware, Household, Specialty Store | Comments Off on Yes Le Panier has Chocolate for Valentine’s Day but So Much More…. Chocolates and Valentine’s Day go together like TV and Netflix. How about I tell you where to find wholesale priced chocolates so you can buy more? 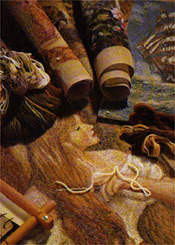 Galerie Au Chocolat recently moved to a new larger facility so there’s extra space for you to see all that they offer. Since 1985, they’ve been producing yummies with fine quality Belgian chocolate and confections for the North American market. They’ve been a best kept secret spot for years, since they were a wholesale but now they sell retail with wonderful prices. 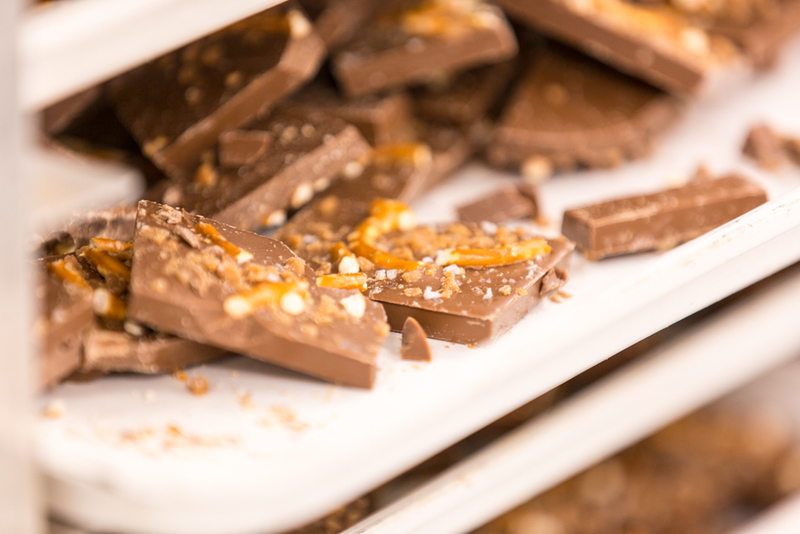 The delish ultra premium items which are made with fine Belgian chocolate (Kosher) come in many interesting varieties: almond or cranberry clusters, chocolate covered orange peel or apricots, Rice Krispie or candy cane bark, Amaretto creams, mint chocolate truffles, espresso wafers, or their famous almond bark. They have a variety of packaging options. You can easily see the treats inside their cellophane bags tied with pretty ribbon, or you can buy them in a gift (or just for you) tin or in a beautifully wrapped gift box. You can fax, email or call in your orders any time. Delivery on the island of Montreal is $10. Whether your taste buds are craving chocolates or you need gifts for everyone you love, head to Galerie au Chocolat. A forever piece of golden jewelry is always a special gift for Valentine’s Day. It doesn’t have to cost a bundle if you head for a jewelry wholesaler. 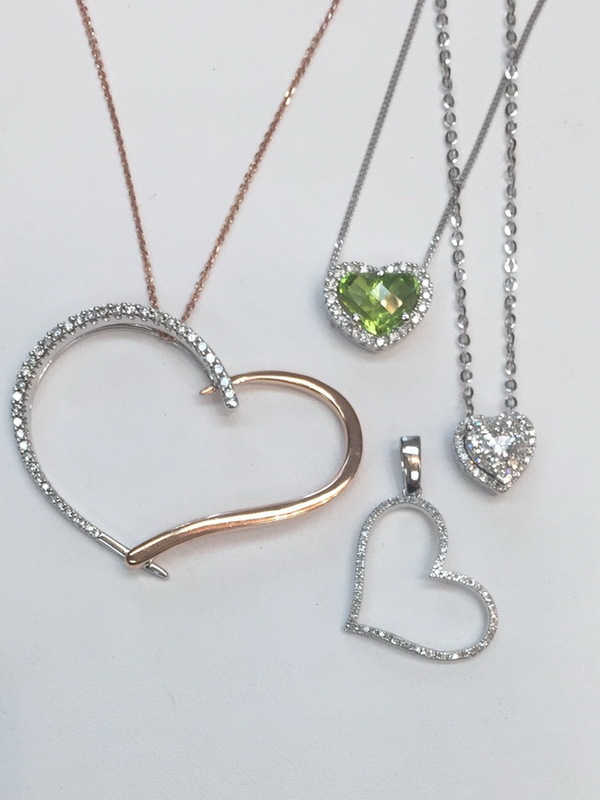 You can pay full price for gold jewelry in full-price retail stores downtown or you can go up to Bijouterie Oro, a wholesaler, and save half your money. Since 1987, this 3rd generation jeweler has been selling wholesale, and is open up to the public. Lucky us. There is lots of golden stock to choose amongst, more than you would see in your small local jewelry store. You could go nutsy over the vast assortment of gold hoop earrings – they sell them by weight. You can select amongst the 100’s of chains; they are strong in 2-tone and 3-colors of gold from Italy or Turkey. There’s 14-carat Italian chain bracelets too, and lots of little religious pendants. If you want to buy illusion diamond studs, they have those too. These earrings give the illusion of a whole stone, but are made up of little ones – for a much littler price. If you have an older diamond (or any other precious stone) ring and you’d like to change it into something more modern, they can show you trays and trays of semi-mounts (that’s what your stone sits in), so you can see exactly what the ring will look like – it can even be tried on. You can take jewelry which has been just sitting in a jewelry box and have it re-modeled. Bijouterie Oro still does local manufacturing, so they can reproduce a piece of jewelry from a photo. And they can repair your broken jewelry too. If you decide to have something made from scratch, it would take about two weeks from the time you walk in the door until you happily present it. The JRC Toys mega toy warehouse sale is the one everyone waits for to score incredible deals. It’s the one-stop Toy Holiday Sale for the most coveted name-brand toys and this year promises to be the biggest sale ever. 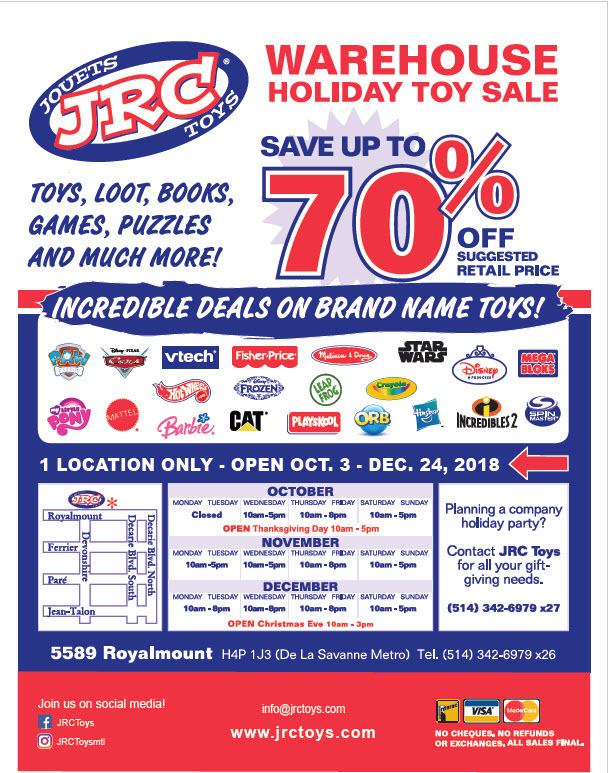 JRC Toys has amazing deals on the hottest toys around and it’s a great time to cross off items on your holiday list while offering you the opportunity to grab discounts of up to 70% off on all kinds of toys. Shop often as new items appear every week. Get some incredible savings on some of the biggest brand names toys including: Barbie, CAT, Crayola,Disney Pixar Cars, Disney Princess, Disney Frozen, Fisher-Price, Hasbro, Hot Wheels, Incredibles 2, Leap Frog, Mattel, Mega Bloks, Melissa & Doug, My Little Pony, ORB, Paw Patrol, Playskool, Spin Master, Star Wars, and VTech. They are now open every day, Monday – Friday till 8pm. They accept debit, Visa Mastercard, but no cheques. There will be no exchanges or refunds, as all sales are final. Head here for the best prices on the most recognizable brand name toys. Nova West Island runs Thrift Shops for NOVA which is having a half price sale at their 4 locations this weekend. The shops fund their charitable foundation which offers home palliative care and cancer support groups and runs 2 adult day centers for the elderly, all without government funding. The 4 stores help raise money for their great cause. You can scoop up second-hand clothing for the family nicely hung on racks, or look for shoes, purses and hats. “Green” shopping by recycling is a planet saving idea: there’s home knick-knacks, china, glassware, jewellery,and books. The sale even includes furniture at the Beaconsfield store. 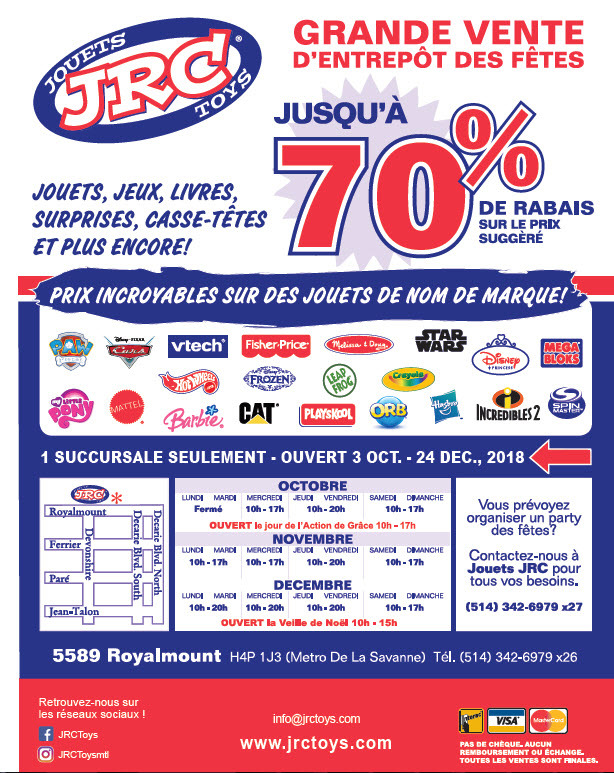 The much awaited JRC Toys mega warehouse sale is baaaaack! Whether you come every year to score incredible deals or just heard about the “open to the public” toy holiday warehouse sale, it is your one stop for the most coveted toys and this year is the biggest sale ever. Get some incredible savings on some of the biggest brand names toys including: Barbie, CAT, Crayola,Disney Pixar Cars, Disney Princess, Disney Frozen, Fisher-Price, Hasbro, Hot Wheels, Incredibles 2, Leap Frog, Lego, Mattel, Mega Bloks, Melissa & Doug, My Little Pony, ORB, Paw Patrol, Playskool, Spin Master, Star Wars, and VTech. Starting November 1st, they are open every day until Christmas. As of December 1st, the hours get increased to Monday – Friday till 8pm. They accept debit, Visa Mastercard, but no cheques. There will be no exchanges or refunds, as all sales are final. 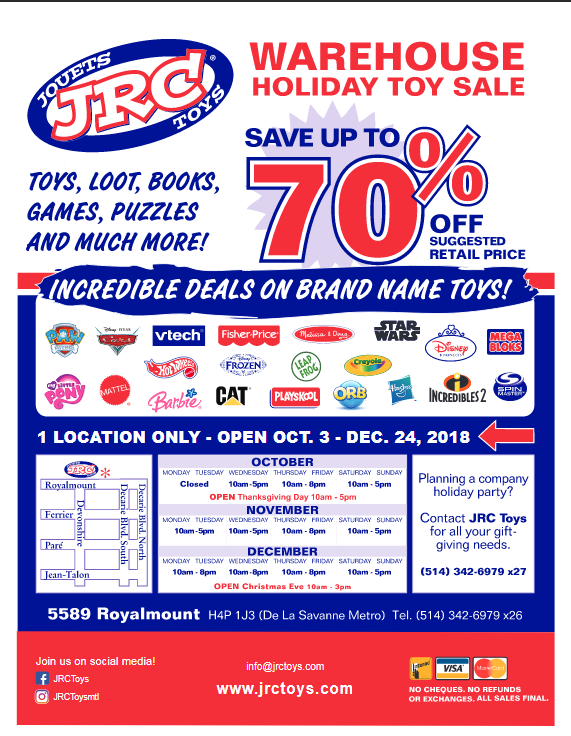 JRC offers you the best prices on the most recognizable brand name toys. No need to wait and wait for online deliveries, just pick them up, take them home and wrap them up.